Founded in 1949, Caimi Brevetti is one of the leading European design-oriented production companies in the furniture and furnishing accessories sector for the office, contract and home. The philosophy that has always underpinned the company's activity is characterized by a solid vocation for research, experimentation and innovation, and it is based on the vast technical and technological experience gained in over sixty years of history: hundreds of products patented by the company are the best testimony of the attention paid to the originality and novelty contents of the projects. Caimi Brevetti products are easily recognizable, their technical appearance, linear, at the same time essential and refined, fully interprets the concept of industrial design, integrating form and function with a view to serial reproducibility based on values ​​such as modularity, versatility, the flexibility and the wise use of materials. At the beginning, the company mostly dealt with the market for home and community fittings, with hundreds of different products, and some of them are by now real classics, while later on they extended their scope also to actual furnishings, completing the range of products with modular shelving systems for the office, house and shop, besides some seating lines specifically designed for waiting rooms, company receptions to air terminals. The sector of furniture accessories and fittings, still now an essential component of Caimi Brevetti's business, is ever-developing, taking in due consideration the trends coming from new information technologies, and by the ever-increasing interest in the themes of comfort and the design of living places and environments. 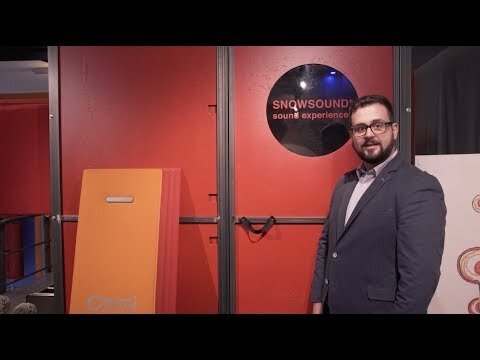 In this regard, the company has directed its scientific and technological research in the field of acoustic wellbeing, patenting a material and a sound absorbing technology, SNOWSOUND, with very high performance characteristics that allow to absorb reverberation in a differentiated way at different frequencies. As per company tradition, technology has been flanked by formal research to obtain sound absorbing objects of design, signed by well-known designers. The SNOWSOUND patent is available in the panel and sound absorbing fabric version, SNOWSOUND-FIBER.